Netflix’s new series Tidying Up with Marie Kondo is making waves. Weird ones. Ones that shouldn’t have become waves– waves made of all the wrong reasons. Based on Kondo’s book The Art of Tidying Up, the series helps people declutter their homes– and lives– from items that don’t “spark joy.” When Kondo made the comment “I now keep my collection of books to about thirty volumes at any one time” and proffered the fact that she tried tearing the meaningful pages out of books to keep, the internet lost its collective mind. And now, this meme is spreading and hell is rising. First, let’s touch base on what “sparks joy.” Kondo indicates that you can own as little or as much as you like– as long as the items bring you happiness in your heart, mind and spirit. She’s not telling you to throw away your prized possessions, but trying to help a world that is bent on hoarding and often has no clue where to shove the clutter. It’s a minimalist approach, but also touches on the concept of Animism, often seen throughout Shinto beliefs. You can thank the item for previously bringing you joy, and then see it off to someone new that it can bring happiness to. She even points out that her methods aren’t for everyone, and that’s okay! Somehow, something gentle and calm and meaningful equated to rage against books and those who write them. 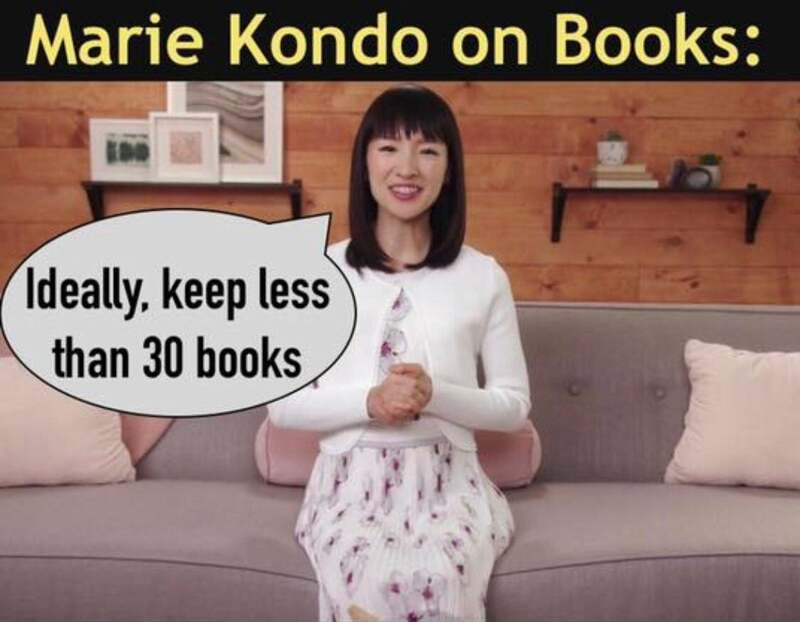 All manner of folks across social media have hung Kondo out to dry, using every bit of colorful language to describe her as someone clearly out of touch with how much joy books bring, how large libraries should be, how DARE her talk about books, etc. To this, let me offer my most professional opinion: y’all, that’s whackadoo. I’ll be the first to tell you that I have an overflowing bookcase, one stuffed with books I’ve never read, one with old books I’ve never even opened, and a few favorites. They’re pouring out into my garage, unceremoniously stacked everywhere. They’re falling off of any level surface I can find in my house. And that, mon frere, does not bring me joy. I adore libraries– I mean, it’s a home made for books! Libraries are where I spent most of my time growing up! But my home is not a library. Sure, I admire parts of my collection, proud of what I have read and eager to read more, but let’s face it: the majority of these books could go, and I wouldn’t miss them. In this, Kondo’s method really speaks to me; I do need to be more mindful of the clutter I collect. Ask myself why about it, feel out why I need to have this or that. I absolutely love holding a book in my hand; in fact, while I appreciate the simplicity and ease of ebooks, I like the feel, the weight, the smell of a book in my hand. But does that whimsical feeling equate to what I have going on, book-collection-wise? No. Perhaps, though, if I cleaned it out, my bookshelf could get back to bringing me joy. So please, join me in quieting this bizarre discourse. If the method doesn’t jive with you, then don’t do it. But let’s not keep ridiculing a woman who offered simplicity and joy as a path for tidying up. Very wisely stated. Anyone who has watched the Netflix show would see Marie is just a tiny, joyful lady. In the show, people keep some strange things and she never questions it. “Ideal” is not something most of us aspire to anyway. I think what she meant is to set a limit that seems reasonable to you. The method is designed to challenge whether something sparks joy or if you just keep it because you spent money on it/ feel guilty for parting with it. Marie seems like a really sweet lady who just wants to help people. I agree, she doesn’t need the ridicule.